Almost everyone has experienced the heartbreak of having an extremely close friend move away. They’re someone that you considered family and now they’re going to be far, far away. You may never even see them again. Being a human going through that kind of thing is difficult, but being an animal going through the same situation? That’s got to be horrible. You have no way of keeping in touch with another animal you were extremely close to and you don’t know what happened to them, if they’re okay, or where they’ve been moved to. It’s sure to be downright depressing. Take Mr. G for example. 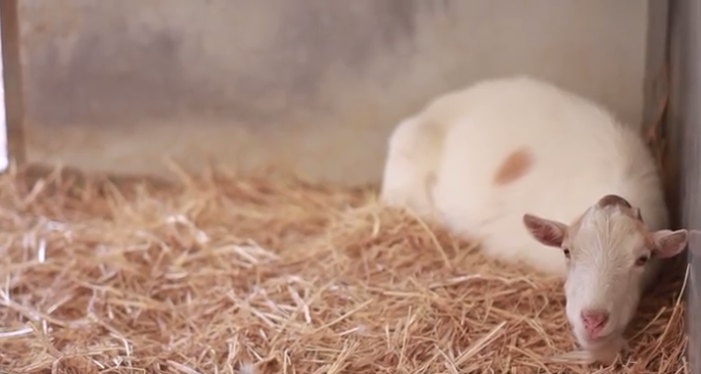 He is a goat who had been living in squalor and neglect for years after being taken in by an animal hoarder in California. He was rescued by Animal Place who gave him his own spacious pen and as much food as he could eat. Despite being relocated to a better home, Mr. G quickly became so depressed that he refused to eat. For 6 days he baffled his new caretakers who could find nothing wrong with him. For all intents and purposes he was a perfectly healthy goat who was just extremely sad. Thankfully, it didn’t take long to find out exactly why he was down in the dumps. You see, while he was living with the animal hoarder, Mr. G had become best friends with a donkey named Jellybean. They had become so close, in fact, that once separated, the goat had a difficult time being away. After this was discovered, the people at Animal Place decided they needed to act. Despite having never taken in a donkey before, the sanctuary decided that the only way to save Mr. G (he would have starved to death otherwise) was to bring Jellybean in. One of the volunteers made a 14 hour round-trip to pick the donkey up from the sanctuary that had taken him in following the rescue. A video shows what happened when the two friends were reunited and it WILL bring a tear to your eye. You can immediately see the goat become more energetic, finally eating now that he had his friend back. If you watch closely, you can see the goat stop and stare at the donkey, as if unable to believe that he was actually there. Sometimes we need a little humanity injected into our lives, and sometimes that humanity comes from things that aren’t even human.